Emotions. I think they often get a very bad press. You might fear the label of being ‘so emotional’ as in daily chatter, this comment can often wrongly point towards some kind of self instability and over-dramatisation. You might keep your feelings very hidden away, being scared of unleashing them. The fear of crying and being unable to stop; the fear of anger and wanting to hurt something or someone; the fear of overwhelming anxiety to the point that you can hardly breathe and fear for your life; the threat of sadness, worried that you might not want to get out of bed and start the day. And what about happiness? Dare you truly feel it, just in case it is momentary and then you feel its loss? You might have been raised to be a ‘good girl or boy’ and learned early that certain feelings were best kept hidden away. You might have understood how to behave and how to please others so that you experienced approval and acceptance. Maybe this worked to some extent. It is certainly beneficial to comply with society’s norms and social etiquette to some degree. The problem comes when you only display emotions that you feel ‘you should’ and push other feelings away, hoping they might disappear. Unfortunately, they do not disappear at all, but start to mount up quite nicely under the carpet creating problems. Often they begin to be expressed in other ways: - through food, through alcohol; through over-work; through depression; through avoidance to name a few. When you are not tapping into the full range of your emotions, the risk is that you start to lose yourself and lose touch with what really matters to you personally. You become adept at being the person that others want you to be. You neglect the parts of yourself that are important and valuable in helping you get your own needs met. You also miss out on your full capacity for joy, because you get dragged down in the daily conflicts that arise when you are not being yourself. 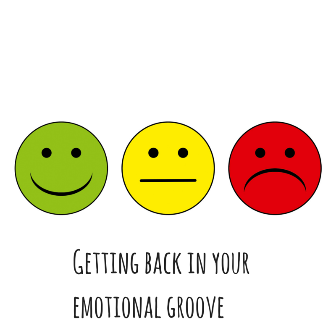 If you recognise yourself here, you are probably wondering how to begin to tap back into your valuable emotional world, and how to start listening to your own feelings again and to trust them? 1. Dare to tune in. Next time, you are caught in a situation and you feel ‘out of sorts’, tune in and try and recognise what you are feeling. You might be able to name the feeling or you might have an image, a word or a feeling in your body that exemplifies it. Rather than push this away of just ignore it, see what comes up for you. If you don’t know straight away, be patient with yourself, be pleased that you are at least trying to notice. 2. Once you have identified your feeling, just accept it and allow yourself to feel it. It doesn’t matter, if you feel ‘you shouldn’t feel this way’ or that someone else might disapprove or whatever other reason. You are having this feeling for a reason. It is telling you something. 3. If you feel overwhelmed with your feeling, maybe take some time out. Go for a walk; remember to breathe; distract yourself. Try to avoid turning to food. The intensity of emotions will vary and often will rise and fall like a wave. Trust that the feeling will pass. 4. When you feel more settled to understand your feeling state, write it down or talk aloud to yourself somewhere private. Just voicing your feelings will help you clarify them and gain understanding of them. 5. Sometimes, you might not wish to act on the feeling. You may be just accepting it and moving on. Or it could be something you might come back to. 6. You might want to talk about how you feel with someone you know is a good listener. Choose people carefully who will support you and allow you to express your feelings without judgement. You may be prone to taking on other people’s opinions sometimes to gain acceptance or approval and this will understandably leave you feeling very unsure about your own point of view. 7. If you recognise a situation that needs resolving, you can always draw up a list of pros and cons of the situation. Start to feel encouraged and empowered that you can take action when listening to yourself. It might take a little while to sort through your feelings about a course of action, but this is absolutely fine. 8. Notice, your inner response to people, events and situations. Do you feel energetic, light, inspired, motivated and joyful? Do you feel oppressed, down, heavy and de-motivated? Listen to the inner guide of your emotions to help you make decisions and take action. The more you do this, the more you will desire and trust the expression, of this most authentic part of yourself.